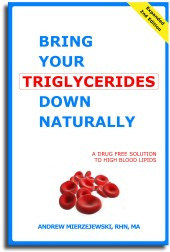 Bring Your Triglycerides Down Naturally | A How-to Book - Full of Health, Inc.
Due to popular demand, our complete, clinically proven triglyceride-reduction program is now available in a book authored by Andrew Mierzejewski, RHN, MA - an accomplished registered holistic nutritionist and president of Full of Health. The single most important dietary supplement that could be a regular part of your diet as it would optimize the level of triglycerides in your blood. Of course, you may find some of the more demanding dietary recommendations in this book uncomfortable, but you know they keep your health and well-being in mind. And that counts.